The Avro Cadet was a single-engined British biplane trainer designed and built by Avro in the 1930s as a smaller development of the Avro Tutor for civil use. The Avro 631 Cadet was developed in 1931 as a smaller, more economical, derivative of the Tutor military trainer, for flying club or personal use. The first prototype, G-ABRS flew in October 1931. 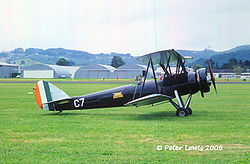 It was publicly unveiled at the opening of Skegness airfield in May 1932, although by this time, the first orders for the type, for the Irish Army Air Corps, had already been placed and the order (for six Cadets) delivered. The Avro 631 Cadet was replaced in production in September 1934 by the improved Avro 643 Cadet, which had a revised rear fuselage with a raised rear seat, retaining the 135 hp (101 kW) Armstrong Siddeley Genet Major 1 engine of the Avro 631. In turn, this formed the basis for the more powerful Avro 643 Mk II Cadet; it was also strengthened and had improved parachute egress. 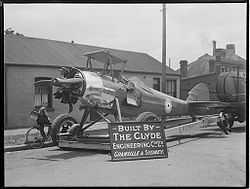 This model entered service in 1935, and was built in the largest numbers, including 34 fitted with a tail wheel for the Royal Australian Air Force. The Cadet, while smaller and more economical than the Tutor, was still more expensive to run than competing two-seat light civil aircraft and was harder to hangar because of its lack of folding wings; so was mainly used as a trainer for flying schools or the military. By far, the largest civil user was Air Service Training Ltd, which operated 17 Avro 631s at Hamble, together with a further four operated by its Hong Kong subsidiary, the Far East Aviation Co. Air Service Training also operated 23 Mk II Cadets, with both these and the earlier Cadets remaining in service with Reserve Training Schools run by Air Service Training until they were impressed as ATC instructional airframes in 1941. 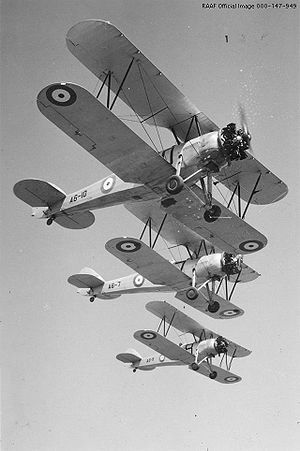 The other major operator was the RAAF, which acquired 34 Mk II Cadets, delivered between November 1935 and February 1939. These remained in service until 1946, when the surviving 16 were sold for civil use. Two of these were re-engined in 1963 with 220 hp (160 kW) Jacobs R-755 engines for use as crop sprayers. In the U.K., only two Cadets survived the war. Avro 631 Cadet Initial version, powered by Armstrong Siddeley Genet Major I engine, 35 built. Avro 643 Cadet Raised rear seat, 8 built. Avro 643 Mk II Cadet Powered by 150 hp (110 kW) Genet Major 1A, 61 built. Royal Australian Air Force operated 34 Avro 643 MkII Cadet. Irish Air Corps operated 7 Avro 631 Cadets. China had 5 Avro 631 deployed at Liuzhou Aviation School during the Second Sino-Japanese War, all of which were lost due to Japanese bombing in 1939. As of 2008, there are two Cadets flying in Australia (VH-AEJ and 'AGH), one in Ireland (the last of the Irish Air Corps machines, though home after a long tour of duty via the U.K. and New Zealand as ZK-AVR) and one reputed airworthy in the Museu do Ar, Portugal. Avro 643 Cadet Pictures and Avro 643 Cadet for Sale.